This page will be devoted to sharing information on the impact of physical activity and academic performance. “The relationship between physical fitness and academic achievement has received much attention owing to the increasing prevalence of children who are overweight and unfit, as well as the inescapable pressure on schools to produce students who meet academic standards. This study examined 259 public school students in third and fifth grades and found that field tests of physical fitness were positively related to academic achievement. Physical Fitness and Academic Achievement in 3rd and 5th grade students. Fit kids are not only healthier and engage in more physical activity than the average student, but they also have faster and more robust neuro-electrical brain responses while reading, according to a new study by researchers from the University of Illinois. The findings were published in the Brain and Cognition journal. What you need to know to ensure your kids are healthy and ready to learn. One of the first and often cited studies on the link between physical fitness scores and academics Standardized testing in language arts and math. Active Education: Growing evidence on physical activity and academic performance. New Evidence: What better academic results? Focus on increasing physical activity. New Evidence: Want Better Academic Results? Focus on Increasing Physical Activity! Article on physical activity and academics. This podcast highlights the evidence that supports the link between physical activity and improved academic achievement. It also identifies a few actions to support a comprehensive school physical activity program to improve academic achievement. 1. “Sacrificing physical education time for classroom time does not improve instruction.” 2. Kids who are more physically active tend to perform better academically. 3. Kids who are physically fit are likely to have stronger academic performance and 4. Activity Breaks can improve cognitive performance and classroom behavior. Physical activity is central to health, and its importance clearly extends beyond its role in achieving energy balance to prevent and treat obesity and overweight. Adequate daily physical activity improves cardiovascular health, metabolic health, brain and mental health, and musculoskeletal health—benefits that recent research shows are gained across the life span. The association between school-based physical activity, including physical education and academic performance. U.S. Department of Health Services with Centers for Disease Control and Prevention. July 2010. Mind and Body: New Research Ties Physical Activity and Fitness to Academic Success. Vail, Kathleen National School Board Journal March 2006. 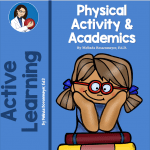 Effect of Physical Education and Activity Levels on Academic Achievement in Children. Relationships of Physical Activity to Brain Health and the Academic Performance of Schoolchildren. Fit kids finish first in the classroom. Coe , Pivarnik , Womack , Reeves, & Malina. Journal of Sports Medicine and Physical Fitness December 2012. The importance of physical activity and aerobic fitness for cognitive control and memory in children. The relationship between physical activity, weight, and academic achievement.